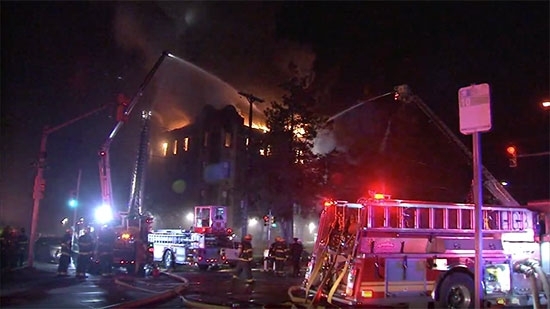 A massive 5-alarm blaze broke out in an apartment building in Overbrook early Monday morning, 12/10, forcing dozens from their homes. It started around 2:15 a.m. on the fourth floor of the Overbrook Gardens apartments on the 900 block of North 63rd Street. Around 180 firefighters battled the fire for over 5 hours in the freezing cold. Two firefighters suffered minor injuries. 57 people have been displaced because the fire. Some neighbors were also evacuated due to the possibility of collapse. PECO had cut power in the neighborhood for the safety of the fire crews, but it is almost back up. The American Red Cross and Philadelphia Office of Emergency Management opened a warming center for the displaced residents at Commodore John Barry Elementary School at 5900 Race Street. The fire may have started because of a tenant burning a candle. A Pennsylvania man who frequently checked a teenage girl out of her high school without her mother's knowledge and ultimately fled to Mexico with her has been sentenced to 2 ½ to 5 years in prison. 45-year-old Kevin Esterly pled guilty last month to a misdemeanor corruption of a minor. Two felony counts were dropped in the plea deal. Those charges included interfering with the custody of a child and concealment of the whereabouts of a child. Esterly and 16-year-old Amy Yu were found at a resort in Mexico about two weeks after they went missing from Allentown. At sentencing, Esterly apologized but said that he was trying to protect her and the relationship was innocent. Yu also testified on his behalf. Lehigh County Court Judge Maria Dantos told him that he had ruined two families and gave the maximum sentence. Authorities on the Main Line are searching for a Villanova man who has been missing since Wednesday, December 5th. 37-year-old Geoff Partridge was last seen leaving his Villanova home around noon on 12/5, according to his wife Jill Turanski. Lower Merion Police found Partridge's 2009 silver Jeep Grand Cherokee partially in the Schuylkill River by River Road in Gladwyne later that day. The car door was open and his keys and phone were inside. Divers did a search of the river. Geoff suffers from bipolar depression. Lower Merion Police Department issued an official Endangered Missing Person Report. Partridge is a white male, 5' 8”, 150 pounds, red hair, and brown eyes. He was wearing a black beanie, black hoodie, gray hoodie, black sweatpants and black boots. If you have any information on his whereabouts, contact police at 610-649-1000. UPDATE: 4/6/19 - The body of Geoff Partridge was found in the Schuylkill River near River Road in Lower Merion. The cause of death is drowning, the manner has been been ruled suicide.